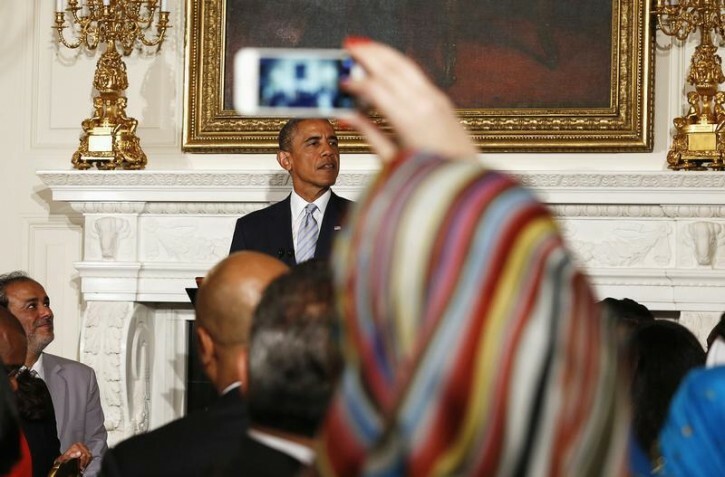 Washington - President Barack Obama praised Egypt’s proposal Monday for a cease-fire between Israel and Hamas militants in the Gaza Strip, telling Muslim-Americans that he’s hopeful that the plan can restore calm in the wake of a deadly wave of violence. The upbeat assessment from Obama came hours after Egypt presented a plan to end a week of heavy fighting that has killed at least 185 people. Both Israel and the Palestinians say they are seriously considering the proposal, which marks the first sign of a breakthrough in international efforts to end the conflict. At the same time, Obama said the U.S. has been “very clear that Israel has the right to defend itself” against an onslaught of rockets being launched indiscriminately by Hamas militants into Israel. He also lamented the death and injury of Palestinian civilians in Gaza during Israel’s military response to quell the rockets, urging that civilians be protected and warning against further escalation by either side. 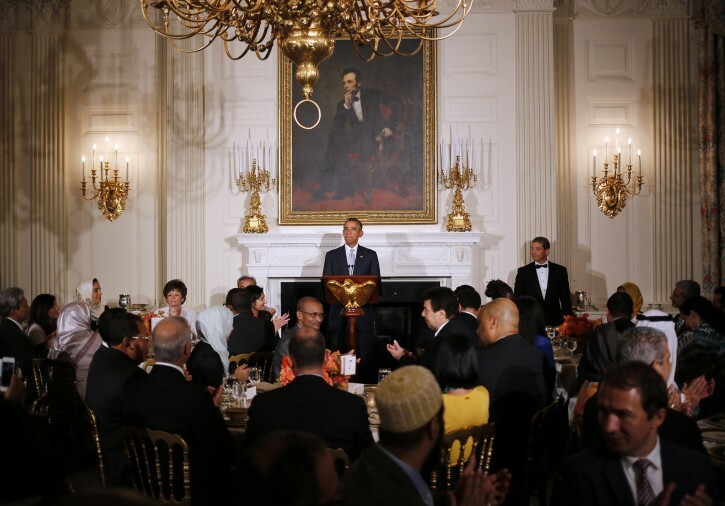 Infusing Obama’s words with a heightened sense of seriousness was his audience in the State Dining Room: Dozens of Muslim-Americans and diplomats from predominantly Muslim countries who gathered for the White House’s annual iftar, or Ramadan evening meal. The only Muslim member of Congress, Rep. Keith Ellison, D-Minn., and Israel’s ambassador to the U.S., Ron Dermer, were also on the guest list. Ahead of the dinner, the American-Arab Anti-Discrimination Committee called for a boycott of all government-hosted iftar dinners, objecting to U.S. support for Israel during the conflict and alleged government spying on Muslim-Americans. Ellison said he shared the group’s concerns but disagreed with the boycott and said it was important for passionate members of the Muslim community to attend. Yes. Let's support a cease fire so that Hamas can rearm and send in more rockets. how many affiliated terrorists or supporters of terrorism were invited to the dinner this time? As long as the world thinks that Israel occupies "palestinian" land, there can be no peace. Israel supported the cease fire proposal. Hamas rejected it. Kudos to President Obama and President Sisi for making Hamas look awful and Israel look great, and no kudos to those like this commenter who don't see how important that is. we don't need a return to the 2012 ceasefire, we need a lasting peace and that won't happen with anymore cease fires. Ceasefires are good for re-arming and re-plotting the next battle. We need to get rid of Hamas and either hang their leader or use a real bullet to the head of all of the Hamas terrorist leaders. Then when the terrorists are gone, we can have a real peace, not a lull in the fighting. There is some truth to that, no? Actually no. There can be no peace as long as the Palestinians think Israel occupies Palestinian land. Convince them and we will have peace.